Mary arrives at Jamaica Inn to discover that her aunt is not as she remembered. Instead of the bright, fascinating young and happy thing, she has turned into a frightened skittish woman. Mary's uncle, Jem Merlyn is a rather overbearing brute of a man who clearly has a secret to keep. This secret disturbs the village, has the attention of the local magistrate and impresses Mary with the urge to talk her aunt into escaping both the Inn and her uncle. There are some very tense moments in this book and it is full of twists, turns and characters that you never know if you can trust. It is a captivating read. For my part, it was something of a slow start, but that is because du Maurier is setting the stage and that takes a bit of care. (It's not like this book is long or anything. It's a mere 304 pages which is a decent length for a mystery!) By the time you are in the middle of the story, questioning everyone and everything you think you might know, it's hard to put Jamaica Inn down. I highly recommend this book for its suspense-filled entertainment value. Alfred Hitchcock adapted this story on screen in 1939. (Movie buffs might recognize that as being the same year that Gone With the Wind and The Wizard of Oz were released.) It is clear that Hitchcock's budget was less than that of GWTW! This was the movie that he made before moving to Hollywood. He also directed young nineteen year old Maureen O'Hara in her first flim. O'Hara plays Mary Yellan in this film and it was definitely interesting to see her in her debut role! 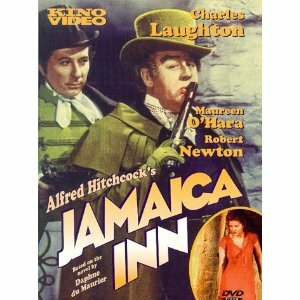 Those interesting facts aside, the only thing that the movie Jamaica Inn seems to share in common with the book is the title and the names of the characters. The characters are not as du Maurier created them to be. Mary's Aunt Patience is a strong woman on film, which is the total and complete opposite of how she is portrayed in the book. Mary is too head strong and there are a lot of scenes in the movie that simply do not exist in the book. Facts are changed and twisted and I simply could not enjoy it at all. Too many changes. I really like Maureen O'Hara as an actress and I can thoroughly enjoy a good Hitchcock flick. Just not this one. I discovered that there is another version of this movie, starring Jane Seymour which seems to have mixed reviews. Not sure I'm willing to give it a go, although I do like Seymour as well. Being that it is not available on DVD I guess I don't have to think about that for the moment! I can say without hesitation that the book Jamaica Inn is an interesting and engaging read, and a good study on ethics (whereas Rebecca was a study in jealousy.) I said previously that I wouldn't want to read Rebecca again because it was broken but now that I'm getting the idea that du Maurier was focused on particular questions, emotions and traits in each of her individual works - I'm far more interested in not only reading Rebecca again but reading more of her stories. So I retract my earlier statements, although I still think Rebecca is a broken story. I have a copy of The House on the Strand so I guess that's the title that is up next for me! I shall indeed look forward to it! I'll be looking for this author...clean suspense is always fun! I just hate it when movie producers do that to books -- use the characters and title and setting but then completely rewrite the story. That's deceptive and lazy in my book. I think I must've read Rebecca way back as a teen. I think I read others of du Maurier's books back then but I can't remember any of them specifically. I went through a crime/suspense phase a few years ago but these days really have to be in the mood for it. But if I do crave something like that, I'll try to remember that du Maurier's books are clean. Have you ever read Fatal Illusions by Adam Blumer? I read it mainly because I know "of" the author, but I really liked it. He is "my kind" of conservative Christian. The Hitchcock film was pretty much nonsense. You make me want to go grab it from the library right now. Definitely going on my list now. I've only read Rebecca , so I'll try to keep DuMaurier in mind when I'm hankering after something suspenseful. I read Jamaica Inn so long ago I can't remember it very well. Besides Rebecca it's the only other du Mauier I've read, though. 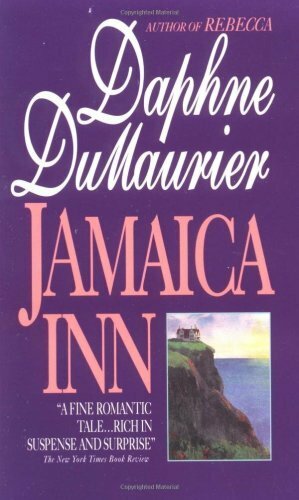 It's been a while since I have read any duMaurier books. I devoured them in high school. I have 3 currently in my TBR pile that I missed so long ago. Enjoy. Thanks for the review and the reminder of a wonderful author. Maureen O'Hara in her first role? I may have to watch this for its historical value. I've seen this book at the library many times, but hesitated to pick it up. Your review convinces me I should! My review of Ginger Garrett's "Wolves Among Us"
Interesting. Do you think you would have liked the movie if you hadn't read the book? SMB - Nah. Don't think I would have liked the movie either which way. It was her first role. First roles are generally, um, learning experiences. ;) And like I said, the film clearly didn't have a budget and it makes it kind of hard to view. I just didn't care for the characters in the movie (even distinguished from those in the book!) and so I'd just as soon have skipped it all together! I have only ever seen the movie Rebecca. I hate to admit that I have not read the book. I planned to once and may have begun it, but I never did. I always loved the film, and this book sounds good. The movie buff in me would enjoy the film. Maureen O'Hara was stunning--I would love to see her debut role. I have added both to my library list.